“Highway Six” supporters applaud outside the courtroom as the defendants exit after the sentencing hearing on Monday. Photo by Jasper Lyons. One day after being sentenced to 30 days in jail, five of the UC Santa Cruz “Highway Six” students were tentatively assigned $28,103.73 for their total restitution costs. Criminal restitution is the amount of money awarded to victims — government agencies in the case of the “Highway Six.” Judge Denine J. Guy gave a tentative ruling because one of the defendants, Rosa Petterson, has not been sentenced since her lawyer is out of the country. Petterson’s criminal sentence, along with the total restitution charge, will be finalized during their next court date on July 27. Tentatively, UCSC PD was awarded $22,335.22, California Highway Patrol (CHP) $2,474.07 and the Santa Cruz Police Department (SCPD) $3,294.44. The agencies originally requested closer to $40,000 in reimbursement. The students’ ability to pay was not considered to determine appropriate restitution costs. In court on Tuesday, prosecutor Conor McCormick brought representatives from the three agencies who sought restitution costs from the defendants to compensate for expenses directly related to the protesters’ actions on Highway 1 on March 3. UCSC PD Lt. Glen Harper and business manager Jimmy Wise were the university’s representatives, and ultimately received just $637.78 less than the full requested amount on behalf of the university. The reimbursement was largely associated with UCSC PD’s “mutual aid,” or requested officers from other UC campuses — nine from Irvine, six from Los Angeles, 12 from Berkeley and 24 from San Francisco. UCSC PD had all 15 of its officers working that day. “If there were no protests, we would still be billed for these services,” Harper said in court. UCSC PD rented cargo vans and SUVs from their fleet services on March 3, and also expected ongoing protests later that day with similar methods the students on the highway used. Around 3:30 p.m. — in the middle of the extraction process of the “Highway Six” — additional tools were purchased from Home Depot “because of the defendants’ behavior” and due to concern that more protests would erupt after the six students were arrested, Harper said. The tools, which included flame-resistant blankets, wire cutters and diamond cutters, went unused and remain in storage at the UCSC police department. Guy chose not to award restitution for those costs. Questioning for Harper and Wise by the five defense attorneys went significantly longer than those for officers from CHP and SCPD. There was debate over costs specifically associated with the defendants actions on the freeway, versus money spent on mutual aid for the week of planned protest activity. 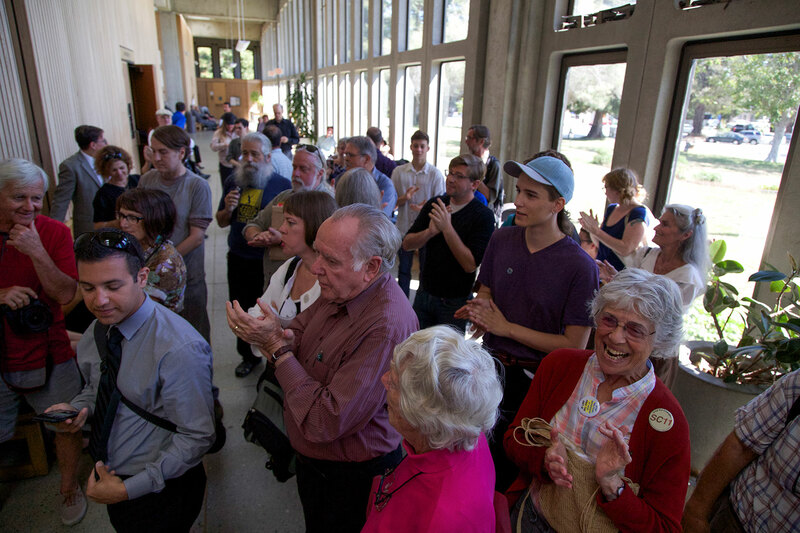 Scoffs ensued when Harper said “I have protesters and future protesters in this room, and I’m not going to divulge that information,” in response to a question about how UCSC PD kept the campus secure with all of its officers on the freeway that day. SCPD was awarded funds for the costs of one response team, one logistics and support team, and overtime pay for four officers who were called into work to supplement the rest of the officers working on the freeway that day. Lt. Dan Flippo said in court that he was compromising on several proposed reimbursements requested by the police chief. Flippo also noted that extra sergeants and detectives were called onto the highway in response to 100 to 200 additional protesters expected to be crowding onto the freeway in support of the six students, when no more than 40 were there. CHP was ruled payment for one officer’s overtime pay and the costs associated with bringing a helicopter and plane to survey the traffic conditions of Highway 17 and back roads, and check if more protesters were approaching. Lt. Brian Hawkins said both forms of aerial support was needed because helicopters can land on the freeway to bring additional supplies, and planes can stay in the air longer than helicopters. Immediately following their next court date in July, the six students will hold a press conference outside the courthouse.